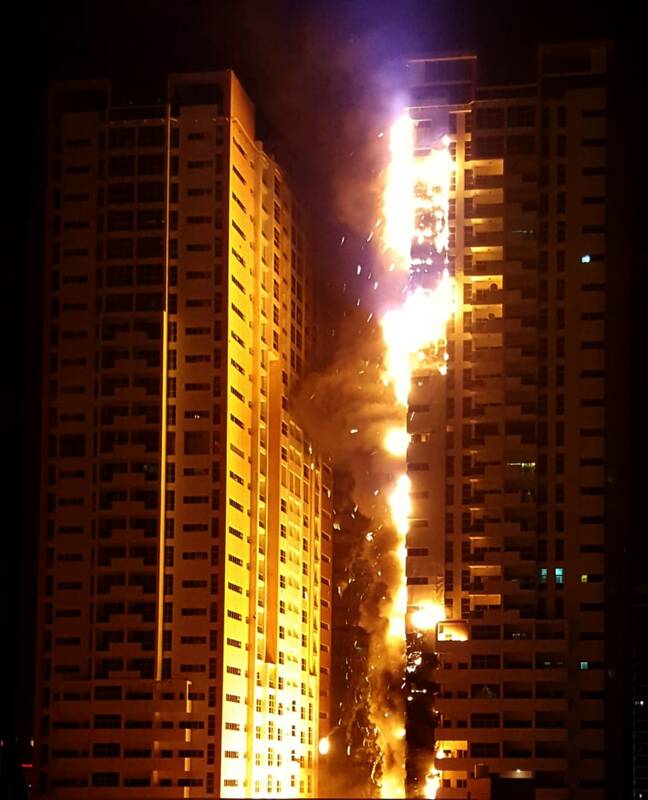 A fire raced up a high-rise tower in the United Arab Emirates city of Ajman late Monday. 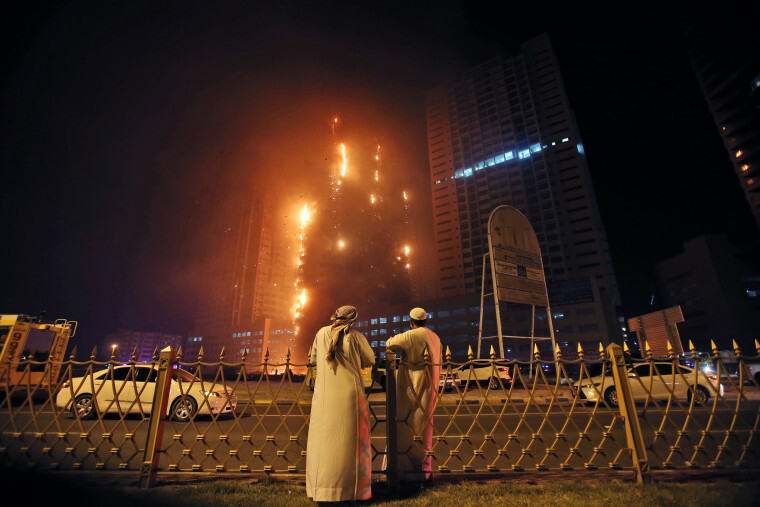 A fire raced up a high-rise tower in the United Arab Emirates city of Ajman late Monday, the latest in a series of skyscraper blazes in the Gulf nation that is home to the world's tallest building. 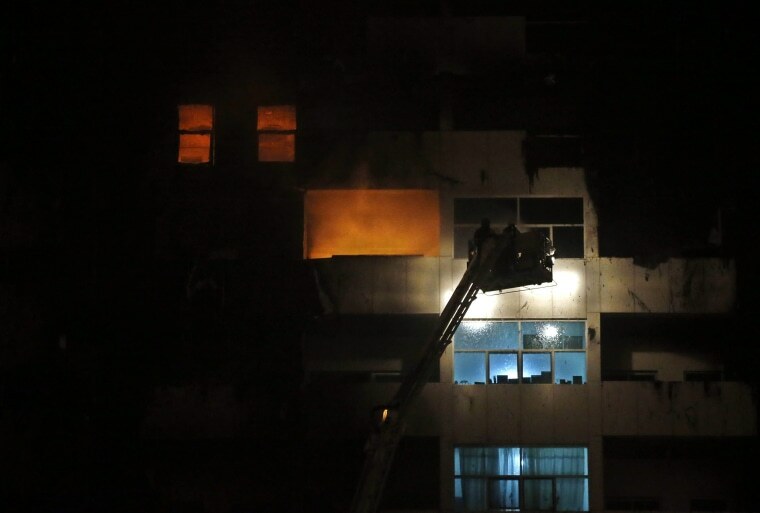 Above: Two Emirati officials watch a high-rise building as a fire spreads up the side of the building in Ajman on March 28, 2016. 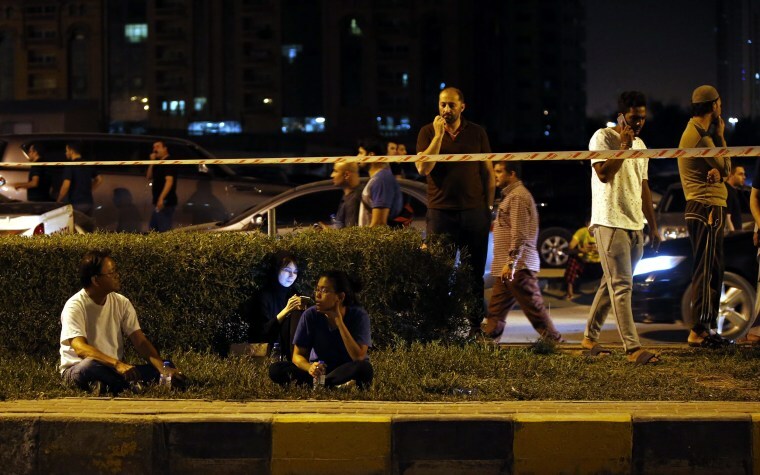 The Emirati interior minister, Sheikh Saif bin Zayed Al Nahyan, rushed to Ajman to help coordinate the response to the blaze, Ajman police said. There were no immediate reports of casualties. Police sealed off a major road near the tower snarling traffic. Hundreds of evacuated residents and onlookers crowded nearby to watch the building go up in flames. 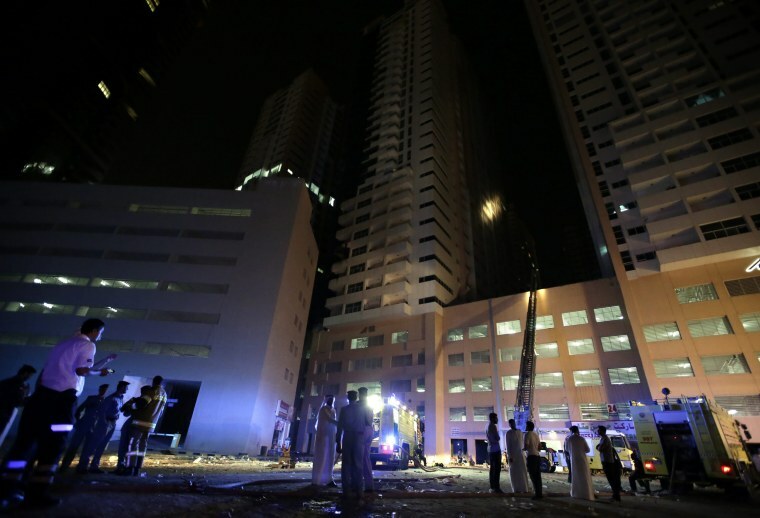 The Dubai-based Gulf News newspaper quoted Ajman Civil Defense director Brig. Saleh Saeed al-Matroushi as saying firefighters were at the scene working to put out the fire. 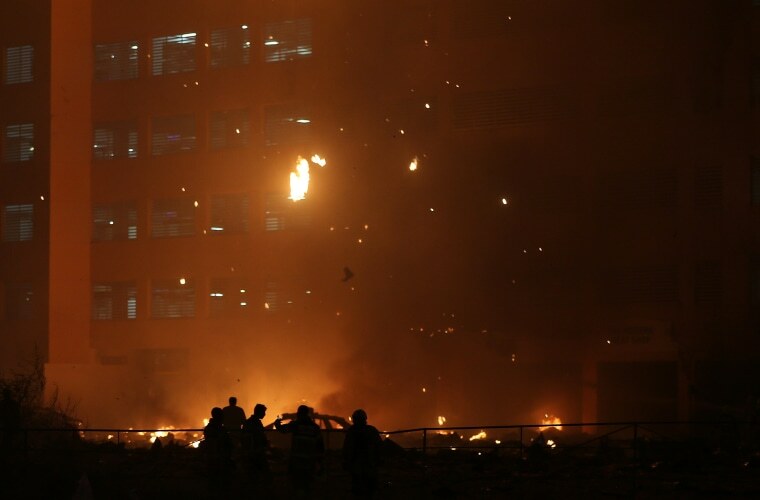 A civil defense official reached by The Associated Press confirmed that firefighting efforts were ongoing late into the night but had no further details. The blaze comes less than three months after a massive fire raced up the exterior of the 63-story The Address Downtown Dubai, one of Dubai's most prominent hotels. It is situated next to Dubai's biggest mall and the Burj Khalifa, the world's tallest skyscraper. 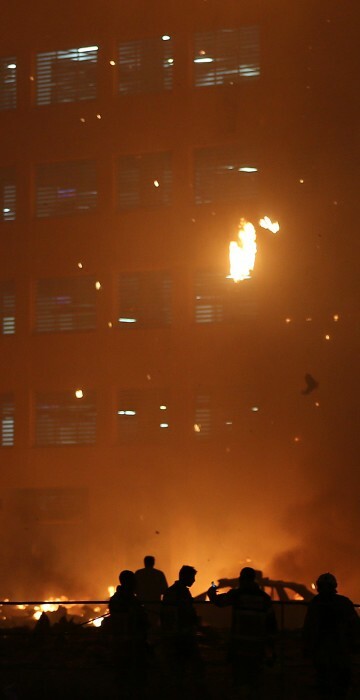 Members of the Civil Defense and fire services extinguish the fire. Building and safety experts have attributed the spate of fires to a material commonly used to cover the buildings known as aluminum composite panel cladding. Some panels used in buildings in the Emirates contain a flammable core that can burn rapidly one ignited, allowing fires to spread quickly on buildings covered top to bottom with the panels without sufficient fire breaks along the way. 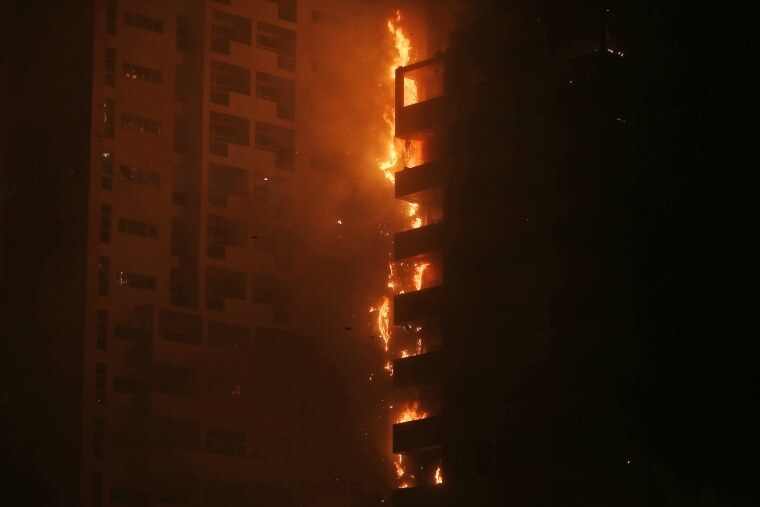 It was not immediately clear if the skyscraper in the Ajman fire had that type of cladding, but images posted on social media appeared to show the fire burning in a similar fashion.